In Eurasia, the Sumerians started to live in villages from about 8,000 BC, relying on the Tigris and Euphrates rivers and a canal system for irrigation. 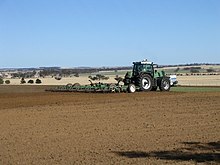 Ploughs appear in pictographs around 3,000 BC; seed-ploughs around 2,300 BC. Farmers grew wheat, barley, vegetables such as lentils and onions, and fruits including dates, grapes, and figs. 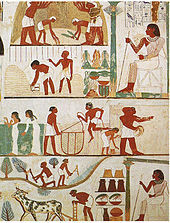 Ancient Egyptian agriculture relied on the Nile River and its seasonal flooding. 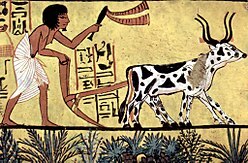 Farming started in the predynastic period at the end of the Paleolithic, after 10,000 BC. Staple food crops were grains such as wheat and barley, alongside industrial crops such as flax and papyrus. In India, wheat, barley and jujube were domesticated by 9,000 BC, soon followed by sheep and goats. Cattle, sheep and goats were domesticated in Mehrgarh culture by 8,000–6,000 BC. Cotton was cultivated by the 5th–4th millennium BC. Archeological evidence indicates an animal-drawn plough from 2,500 BC in the Indus Valley Civilisation. In China, from the 5th century BC there was a nationwide granary system and widespread silk farming. Water-powered grain mills were in use by the 1st century BC, followed by irrigation. By the late 2nd century, heavy ploughs had been developed with iron ploughshares and mouldboards. These spread westwards across Eurasia. 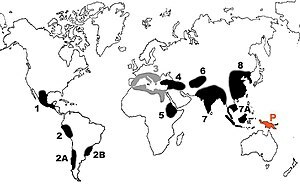 Asian rice was domesticated 8,200–13,500 years ago – depending on the molecular clock estimate that is used – on the Pearl River in southern China with a single genetic origin from the wild rice Oryza rufipogon. In Greece and Rome, the major cereals were wheat, emmer, and barley, alongside vegetables including peas, beans, and olives. Sheep and goats were kept mainly for dairy products. In the Middle Ages, both in the Islamic world and in Europe, agriculture was transformed with improved techniques and the diffusion of crop plants, including the introduction of sugar, rice, cotton and fruit trees such as the orange to Europe by way of Al-Andalus. After 1492, the Columbian exchange brought New World crops such as maize, potatoes, tomatoes, sweet potatoes and manioc to Europe, and Old World crops such as wheat, barley, rice and turnips, and livestock including horses, cattle, sheep and goats to the Americas. 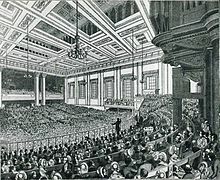 Irrigation, crop rotation, and fertilizers advanced beginning in the 19th century, triggered by the British Agricultural Revolution, allowing global population to rise significantly. Since 1900, agriculture in developed nations, and to a lesser extent in the developing world, has seen large rises in productivity as human labor was replaced by mechanization, and assisted by synthetic fertilizers, pesticides, and selective breeding. 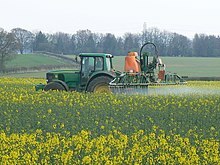 The Haber-Bosch method allowed the synthesis of ammonium nitrate fertilizer on an industrial scale, greatly increasing crop yields and sustaining a further increase in global population. Modern agriculture has raised ecological, political, and economic issues including water pollution, biofuels, genetically modified organisms, tariffs and farm subsidies, leading to alternative approaches such as the organic movement. ^ Larson, Greger; Dobney, Keith; Albarella, Umberto; Fang, Meiying; Matisoo-Smith, Elizabeth; Robins, Judith; Lowden, Stewart; Finlayson, Heather; Brand, Tina (11 March 2005). "Worldwide Phylogeography of Wild Boar Reveals Multiple Centers of Pig Domestication". Science. 307 (5715): 1618–1621. Bibcode:2005Sci...307.1618L. doi:10.1126/science.1106927. PMID 15761152. ^ a b Gerritsen, R. (2008). Australia and the Origins of Agriculture. 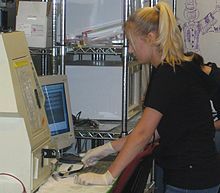 Archaeopress. pp. 29–30. doi:10.1007/978-1-4419-0465-2_1896. ISBN 9781407303543. ^ Gupta, Anil K. (2004). "Origin of agriculture and domestication of plants and animals linked to early Holocene climate amelioration" (PDF). Current Science. 87 (1): 59. JSTOR 24107979. ^ Possehl, Gregory L. (1996). Mehrgarh in Oxford Companion to Archaeology, Ed. Brian Fagan. Oxford University Press. ^ Needham, Vol. 6, Part 2, pp. 55–57. ^ Needham, Vol. 4, Part 2, pp. 89, 110, 184. ^ Needham, Vol. 4, Part 2, p. 110. ^ White, K. D. (1970), Roman Farming. Cornell University Press. ^ Francis, John Michael (2005). Iberia and the Americas. ABC-CLIO. ISBN 978-1-85109-426-4. ^ Ford, Richard I. (1985). Prehistoric Food Production in North América. University of Michigan, Museum of Anthropology, Publications Department. p. 75. ISBN 978-0-915703-01-2. ^ Wilson, Gilbert (1917). Agriculture of the Hidatsa Indians: An Indian Interpretation. Dodo Press. pp. 25 and passim. ISBN 978-1409942337. Archived from the original on 14 March 2016. ^ Jones, R. (2012). 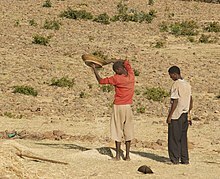 "Fire-stick Farming". Fire Ecology. 8 (3): 3–8. doi:10.1007/BF03400623. 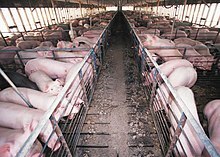 ^ "Chinese project offers a brighter farming future". Editorial. Nature. 555 (7695): 141. 7 March 2018. Bibcode:2018Natur.555R.141.. doi:10.1038/d41586-018-02742-3. PMID 29517037. ^ a b "Agricultural Production Systems". pp. 283–317 in Acquaah. ^ Richards, A. J. (2001). "Does Low Biodiversity Resulting from Modern Agricultural Practice Affect Crop Pollination and Yield?" (PDF). Annals of Botany. 88: 165–172. doi:10.1006/anbo.2001.146 (inactive 3 November 2018). Retrieved 10 July 2018. ^ Our planet, our health: Report of the WHO commission on health and environment. Geneva: World Health Organization (1992). ^ Milius, Susan (13 December 2017). "Worries grow that climate change will quietly steal nutrients from major food crops". Science News. Retrieved 21 January 2018. ^ a b Porter, J. R., et al., Executive summary, in: Chapter 7: Food security and food production systems (archived 5 November 2014), in IPCC AR5 WG2 A (2014). Field, C. B.; et al. (eds.). Climate Change 2014: Impacts, Adaptation, and Vulnerability. Part A: Global and Sectoral Aspects. Contribution of Working Group II (WG2) to the Fifth Assessment Report (AR5) of the Intergovernmental Panel on Climate Change (IPCC). Cambridge University Press. pp. 488–489. ^ Blanco, G., et al., Section 5.3.5.4: Agriculture, Forestry, Other Land Use, in: Chapter 5: Drivers, Trends and Mitigation (archived 30 December 2014), in: IPCC AR5 WG3 (2014). Edenhofer, O.; et al. (eds.). Climate Change 2014: Mitigation of Climate Change. Contribution of Working Group III (WG3) to the Fifth Assessment Report (AR5) of the Intergovernmental Panel on Climate Change (IPCC). Cambridge University Press. p. 383. Archived from the original on 27 November 2014. . Emissions aggregated using 100-year global warming potentials from the IPCC Second Assessment Report. ^ Porter, J. R., et al., Section 7.5: Adaptation and Managing Risks in Agriculture and Other Food System Activities, in Chapter 7: Food security and food production systems (archived 5 November 2014), in IPCC AR5 WG2 A (2014). Field, C.B. ; et al. (eds.). Climate Change 2014: Impacts, Adaptation, and Vulnerability. 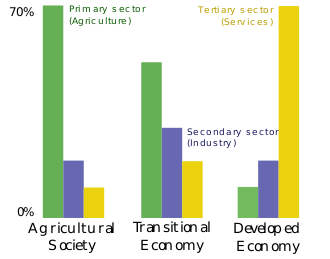 Part A: Global and Sectoral Aspects. Contribution of Working Group II (WG2) to the Fifth Assessment Report (AR5) of the Intergovernmental Panel on Climate Change (IPCC). Cambridge University Press. pp. 513–520. ^ Oppenheimer, M., et al., Section 19.7. Assessment of Response Strategies to Manage Risks, in: Chapter 19: Emergent risks and key vulnerabilities (archived 5 November 2014), in IPCC AR5WG2 A (2014). Field, C.B. ; et al. (eds.). Climate Change 2014: Impacts, Adaptation, and Vulnerability. Part A: Global and Sectoral Aspects. Contribution of Working Group II (WG2) to the Fifth Assessment Report (AR5) of the Intergovernmental Panel on Climate Change (IPCC). Cambridge University Press. p. 1080. ^ Smith, P., et al., Executive summary, in: Chapter 5: Drivers, Trends and Mitigation (archived 30 December 2014), in: IPCC AR5 WG3 (2014). Edenhofer, O.; et al. (eds.). Climate Change 2014: Mitigation of Climate Change. Contribution of Working Group III (WG3) to the Fifth Assessment Report (AR5) of the Intergovernmental Panel on Climate Change (IPCC). Cambridge University Press. pp. 816–817. Archived from the original on 27 November 2014. ^ Silvertown, Jonathan; Poulton, Paul; Johnston, Edward; Edwards, Grant; Heard, Matthew; Biss, Pamela M. (2006). 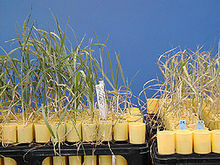 "The Park Grass Experiment 1856–2006: its contribution to ecology". Journal of Ecology. 94 (4): 801–814. doi:10.1111/j.1365-2745.2006.01145.x. ^ "Agriculture: Not Just Farming". European Union. 16 June 2016. Retrieved 8 May 2018. Acquaah, George (2002). 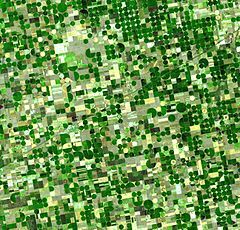 Principles of Crop Production: Theory, Techniques, and Technology. Prentice Hall. ISBN 978-0-13-022133-9. Needham, Joseph (1986). Science and Civilization in China. Taipei: Caves Books.